Ariane 5 moves from the Launcher Integration Building to the Final Assembly Building, riding on one of two mobile launch tables for the heavy-lift vehicle. The second launch table is visible in the foreground, at right, awaiting Arianespace’s subsequent Ariane 5 mission. 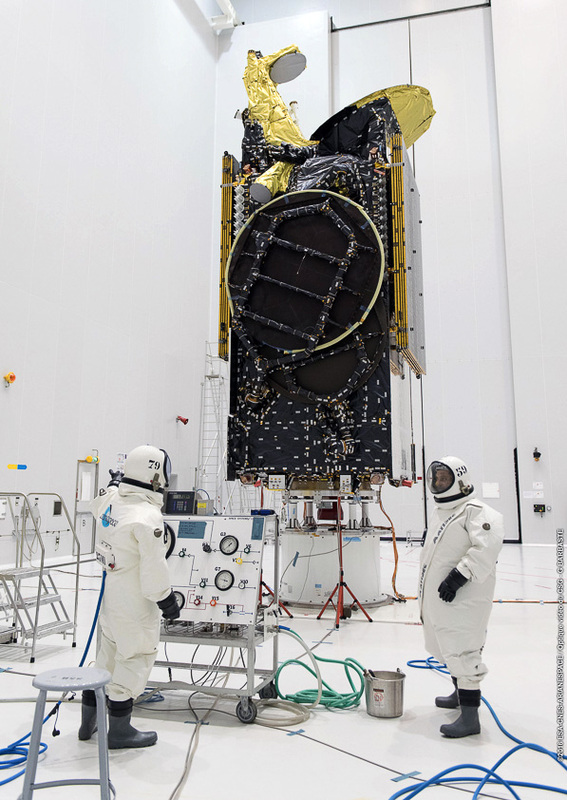 The preparations for Arianespace’s second Ariane 5 launch of 2016 are continuing for a March 9 liftoff from French Guiana, with the heavy-lift vehicle now transferred to the Spaceport’s Final Assembly Building, and its EUTELSAT 65 West A satellite payload undergoing its fueling. EUTELSAT 65 West A is fueled in the Spaceport’s S5 satellite preparation facility. Designated Flight VA229 in Arianespace’s launcher family numbering system, the mission has a lift performance estimated at 6,764 kg. – which includes the 6,615 kg. mass of EUTELSAT 65 West A, along with the hardware used for this single payload’s integration on the Ariane 5. 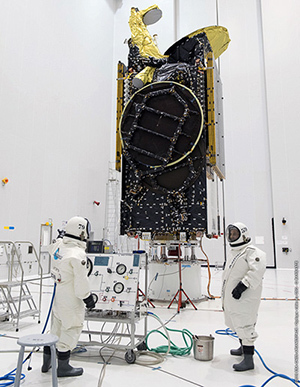 EUTELSAT 65 West A will be 31st satellite launched by Arianespace for the Paris, France-based Eutelsat, which supplies satellite capacity and services for video, data and broadband applications. After Ariane 5’s delivery to geostationary transfer orbit, the SSL-built (Space Systems Loral) satellite will be maneuvered to an orbital slot of 65 deg. West, where it will serve expanding markets in Brazil and across Latin America. EUTELSAT 65 West A combines broad coverage in C- and Ku-bands for video distribution, cellular backhaul and direct-to-home broadcasting with a high throughput payload for broadband access in the Ka-band. Flight VA229 is part of Arianespace’s busy launch manifest for 2016. The company is targeting as many as eight missions utilizing the Ariane 5, with other flights performed by the medium-lift Soyuz and lightweight Vega.